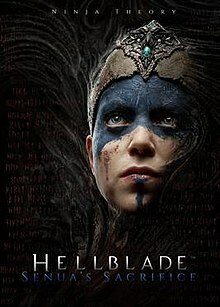 Hellblade: Senua's Sacrifice is a dark fantasy action-adventure game developed and published by the British video game development studio Ninja Theory. Self-described as an "independent AAA game", it was created by a team of approximately twenty developers led by writer and director Tameem Antoniades. It was released worldwide for Microsoft Windows and PlayStation 4 in August 2017, with an Xbox One version in April 2018. The game features support for virtual reality, which was added in an update in 2018. A Nintendo Switch version was released on 11th April, 2019. ^ Dash, Mike (March 18, 2013). "The Vengeance of Ivarr the Boneless". Smithsonian.com. Smithsonian. Retrieved March 30, 2015. ^ "Curriculum Vitae". melinajuergens.wixsite.com. Retrieved May 3, 2018. ^ "Hellblade: Senua's Sacrifice". Metacritic. Retrieved April 16, 2019. ^ "Hellblade: Senua's Sacrifice". Metacritic. Retrieved May 5, 2018. ^ Campbell, Evan. "Hellblade: Senua's Sacrifice Has Sold 1 Million Copies". IGN. Retrieved June 22, 2018.